A Burlington developer has won approval to build a three-story duplex after an epic battle with the city that spanned 10 years. The Burlington Development Review Board gave Anne Rothwell permission in February to construct the building at 189-191 South Champlain Street. Back in 2013, a zoning dispute over the site became highly publicized when the city alleged Rothwell committed "demolition by neglect" — failing to maintain a home and allowing deterioration to advance until destroying it became necessary. The circa-1884 single-family house had stood in the Battery Street Historic District. Rothwell disagreed with the finding at the time. But two years ago, in an effort to resolve the matter, she accepted a settlement and paid the city $34,253 in fines. The developer recently spoke to Seven Days at the vacant lot, which sits between Maple and King streets. A dirty snow bank melted into last year's weeds as people strolled briskly past. Rothwell said she wanted to start construction on the site this year or next. "Decrepit" was the operative word for the property when Rothwell bought it for $160,000 in 2008. The sagging one-and-a-half-story home had imitation brick siding and no tenants. "I thought, Oh wow, this is a renovation with a lot of potential," Rothwell said. "I thought, Walking distance to a grocery store and the lake and downtown? and What could be better? The thought was to renovate and make it into something cool. But it was a mess." She planned to sit on the house, ponder the renovation and obtain financing, she said. But neighbors weren't happy that it was vacant. Nine months after she closed on the home, in November 2009, the city received a complaint that transients had gotten into the house and left "feces, urine and various used personal products." A year later, an interior fire, possibly started by squatters, gutted the place. Rothwell said she had attempted to secure the vacant home, as the law requires, but "it was Night of the Living Dead. People just kept getting in there." After the fire, Rothwell concluded that the building was beyond saving. She proposed to demolish the structure, reseed the lawn and leave the lot vacant. Rothwell said she wanted to again take time to consider her options. The review board denied the demolition application in August 2010, contending, among other things, that the structure still had historic value. Rothwell responded with a proposal to demolish it and build a multistory duplex with parking below it, but withdrew her application in November 2012. A month later, the city ordered the building demolished, because it was dangerous. In February 2013, Burlington cited Rothwell for demolition by neglect. "It's not a real common complaint or a problem, but it certainly happens once or twice a year," said Bill Ward, the city's director of code enforcement. Such orders usually involve historic barns or garages — not houses, he added. Under a law that protects affordable housing stock, teardowns in Burlington must generally be offset by new housing or by a contribution to an affordable housing fund. Rothwell's fines included payment to such a fund. For her part, Rothwell said she was trying to do the right thing all along with a dilapidated property entangled in a nightmarish web of contradictory codes. Still, Rothwell said, the city planning and zoning department has been good to work with during the last two years, and she was "elated" that the project was finally moving forward. Not everyone is happy about the plans. 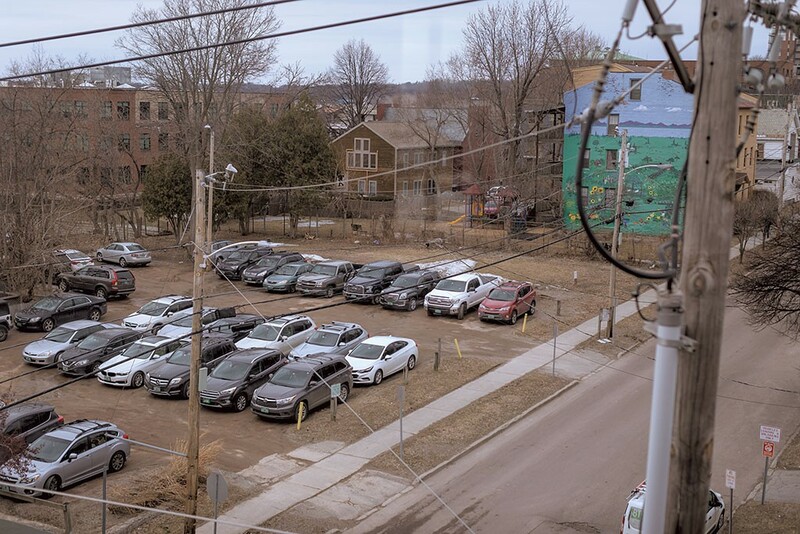 Eric Johnson, who lives on the top floor of a seven-unit apartment building that he owns at 183 South Champlain Street, contends that Rothwell's duplex will cast a permanent shadow on the pocket park between her property and his. Based on the approved design, the building will look like a "migrant detention center" and form "a tall, dark charcoal-gray wall," Johnson said, adding: "Who's going to want to go into that park?" The proposed duplex would be 35 feet tall — the same height, Johnson acknowledged, as his own building. But he questioned the scale for a two-unit structure. "Mine's a seven-unit," he said. Rothwell defended the long, narrow design by Burlington architect Israel Smith. It will bring a handsome, updated building to the block, complete with a rooftop terrace that holds garden sheds, she said. Rothwell plans to live in one unit and possibly rent or sell the other, and she noted that at least four people have already expressed interest in a purchase. The Battery Street Historic District, a grid of streets just south of downtown, encompasses more than 120 buildings constructed during Burlington's early commercial and industrial era. The district includes many modest houses with slate roofs and two-over-two sash windows, where workers returned on foot after their shifts at nearby lumber yards, biscuit factories, bobbin mills and glassworks. Johnson's federal-style building served as the Gray's Carriage Works factory in the 1830s. Over the years the neighborhood prospered and declined. These days the area is on an upswing in housing-hungry Burlington. Just across the street from Rothwell's lot, Redstone developer Erik Hoekstra recently renovated a former brick schoolhouse at 194 South Champlain Street into three deluxe one-bedroom apartments. He sold the building for $820,000 in March and an adjacent single-family home at 202 South Champlain Street for $275,000 last year. He bought both properties for a total of $450,000 in 2015 — but says the flip was not as lucrative as it sounds due to substantial renovation costs. Rothwell knows the neighborhood, and Burlington, well. She grew up on South Willard Street and sold jewelry from a cart on Church Street as an undergrad at the University of Vermont. In 1992, she launched Club Metronome above Nectar's on Main Street. She sold her stake in 1999 and, with business partner Louis Natale, started her career as a real estate developer. The two built an eight-unit condo complex in the old Hood milk plant on South Winooski Avenue in 2005 and added four apartments there in 2015. Rothwell has also redeveloped three historic buildings in Winooski and owns or manages numerous apartment units in both Burlington and the Onion City. 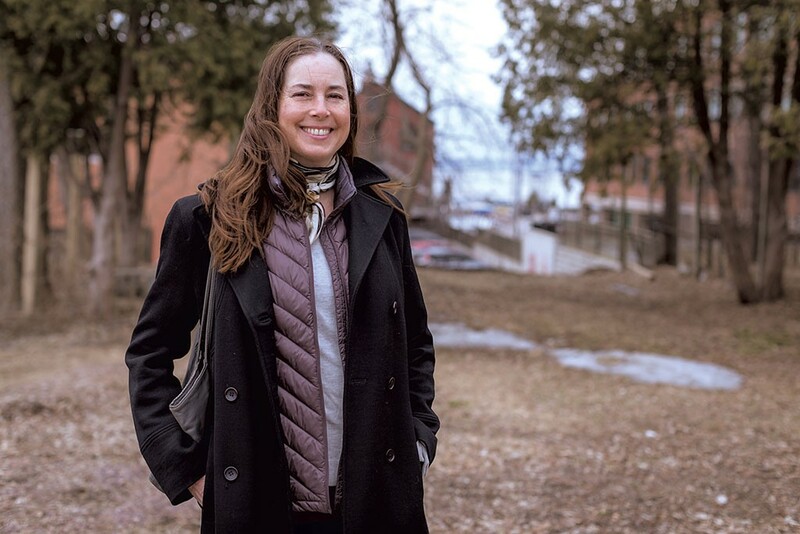 She's particularly interested in fixing up old buildings, so the "demolition by neglect" finding on her South Champlain Street property stings, Rothwell said. Burlington zoning regulations require additional scrutiny of projects that call for tearing down structures that may have historically significant features. Some teardowns are denied, but others are green-lighted, particularly if they allow for more units. Several older structures came down to make way for Redstone's 30-unit apartment building at Pine Street and Flynn Avenue in the South End, and for the Vaults, the Unsworth Properties' office, apartment and artist studio building now being leased on Howard Street. The Bove family wants to tear down two rental houses on George Street and the former Bove's Café on Pearl Street to make way for a 93-room hotel and a 20-unit senior apartment building. Hoekstra initially wanted to tear down the small green house at 202 South Champlain but dropped the idea. "I love historic buildings, but in my view, there's a difference between a building that is historically significant and a building that is just old," Hoekstra said. Some say the changes in the historic hood have paved the way for gentrification. Hoekstra disagrees and observed that between the Burlington Housing Authority and Champlain Housing Trust, many units have been preserved for affordable housing. "It's a mixed blessing," Johnson said about the recent real estate trends. Even though he thinks Rothwell's duplex will "be an eyesore," he predicts it will boost the value of his property and others on the street. "I figure I can't really lose," he said. Johnson bought his building for $216,000 in the mid-1980s. The neighborhood was "much tougher," with motorcycles roaring at night and a rowdy bar around the corner called the Alley Cat where patrons could "literally order drugs," Johnson said. The street has improved, and young families use the playground equipment in the pocket park, he said. As for the building that once housed the Alley Cat? It will soon serve up squash blossom tempura. Lion Turtle Tea is expected to open at 41 King Street this summer. Still, Johnson was flabbergasted to learn the price that Hoekstra got for his red brick building. "God only knows what mine's worth," he said. Johnson went on to say that he "can always cash out" but wondered about the cost of moving in. "The idea that our neighborhood is affordable? Good luck with that," he said. "Not anymore."